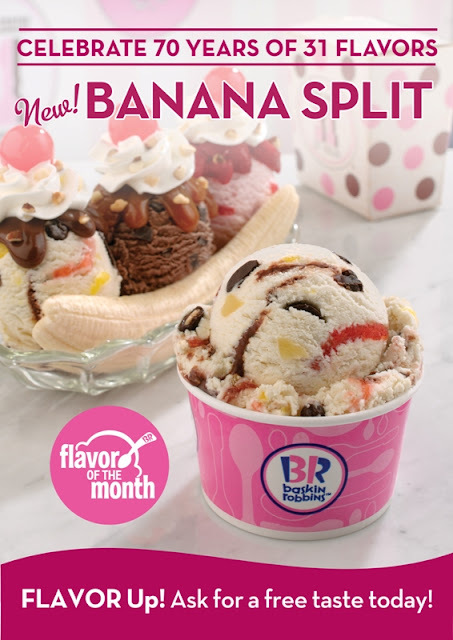 Baskin-Robbins, the world’s largest chain of ice cream specialty shops, celebrates 70 years of serving unique and delectable ice cream flavors by introducing a new Flavor of the Month, Banana Split. This delicious frozen treat features banana flavored ice cream topped with chocolate covered cherry pieces and almonds, dotted with pineapple bits and swirled with strawberry and hot fudge ribbons. It’s like enjoying an indulgent banana split sundae with every spoonful. Sip a scoop of this new ice cream flavor as a milkshake, or try it as a sundae by topping it with caramel, hot fudge or strawberry syrup, whipped cream, nuts and a cherry. To experience Baskin-Robbins’ Banana Split, visit Baskin-Robbins shops at the Central Square, Bonifacio Global City; Greenbelt 5 and Glorietta 5 in Makati; Fairview Terraces and Trinoma Mall in Quezon City. For more details about Baskin-Robbins, visit www.baskinrobbins.ph or check out their Facebook (facebook.com/baskinrobbinsph), Twitter and Instagram (baskinrobbinsph) accounts.